The automaker goes all in on future autonomy. The world of autonomous cars is coming. Maybe it's a utopian future where all the vehicles drive themselves, while traffic jams and road rage are a thing of the past. Or maybe it's just a bunch of fancy robo-taxis (and hopefully buses) that ensure city commuting is less of a pain. No matter how it plays out, it's coming and BMW wants to be prepared, by establishing its own autonomous driving campus. In Unterschleißheim (near Munich, Germany) the automaker opened the facility it says will help with the "systematic development of highly and fully automated driving at the BMW Group." At the event, Klaus Fröhlich of BMW AG's board of management said, "It is important because autonomous driving will change the automotive industry." The goal is to build pilot projects at the facility and that BMW is building a cornerstone of artificial development here. 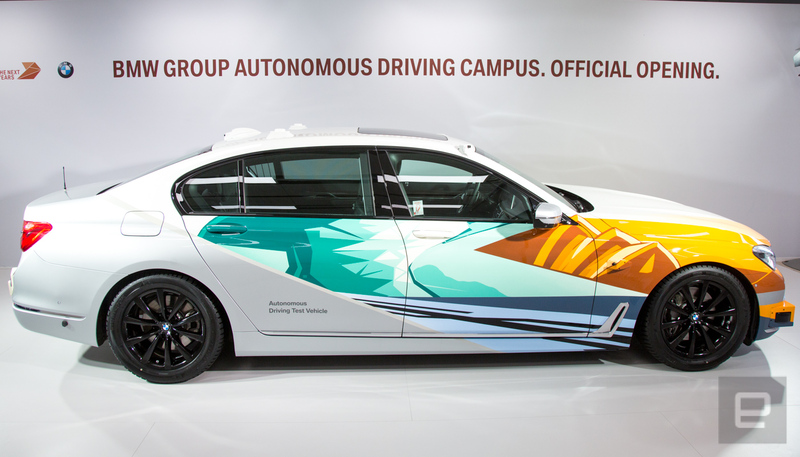 The campus in Germany joins the automaker's research office in Mountain View, California, working on BMW's place in the autonomous driving world. Both facilities will have cars on the road and in simulators -- BMW has three test cars in the United States already. Those vehicles gather data while driving and help the company work on edge-case scenarios, all of which are set to expand hugely. By the end of 2018, BMW expects to have 40 additional test vehicles in the US and 80 worldwide, driving around countries including China, Israel and Germany. In addition to real-world testing, the company will use simulations to train its autonomous program. Thomas Bachman, autonomous driving head of test validation and integration, said that the core of the system was built by BMW with several technologies sourced from other companies. Bachman referred to them as bricks of a house that is still unmistakably BMW's. The actual house of autonomous driving for BMW is a no-brainer. It's located near the automaker's global headquarters in Munich and the company's data center is also a little over a mile away -- which is helpful considering the immense amount of information being handled. Autonomous cars can generate around 16 to 40 terabytes of data per day, according to BMW. The campus is still under construction, but the main building and workshop are already complete. A small track is also incoming, but it will mostly be used for calibrating test vehicles according to Bachman. BMW reiterated that its first level 3 autonomous production vehicle, the iNext is coming to public roads in 2021 but clearly, the automaker is in it for the long haul. Fröhlich said, "We know it's a marathon. It's a huge challenge." In other words, it's going to be a while before we're all in autonomous cars. But right now, automakers need to go all in on our driverless future.